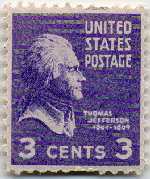 Thomas Jefferson has appeared on numerous United States stamps as a result of serving as President of the United States. He also made an important contribution to America's libraries. He built a significant personal library at Monticello, his home in Virginia, which he cataloged using his own classification system. 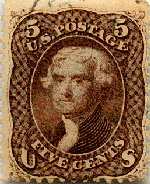 He sold his library to the Federal government after the Library of Congress, which was located in the Capitol, was destroyed by the British in 1814. In doing so he explained, "I do not know that it contains any branch of science which Congress would wish to exclude from their collection; there is, in fact, no subject to which a Member of Congress may not have occasion to refer." 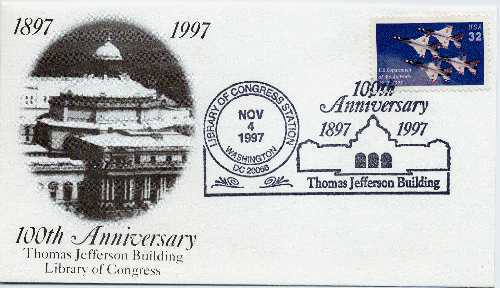 The Library of Congress recognized Jefferson's contribution by naming its historic 1897 building the Thomas Jefferson Building. Jefferson designed the Rotunda at the University of Virginia which served as the Library for the University.